Tag line: "Who Will Be His Bride Tonight?" Produced in England in 1958, Horror of Dracula was Hammer Studio’s take on the world’s most famous bloodsucker. In fact, the title of this film was changed in the United States (in its native England, it was simply Dracula) to avoid confusion with the classic 1931 Bela Lugosi film, which was still playing theatrically in select areas across the country. Although I can understand the concern, the fact remains any confusion between these two versions was highly unlikely. For starters, because of the strict regulations governing film production at the time, 1931’s Dracula was made without spilling a single drop of blood on-screen. In Horror of Dracula, the red stuff starts to spatter during the opening credits! Jonathan Harker (John Van Eyssen) travels to a remote region of Eastern Europe to do battle with the evil Count Dracula (Christopher Lee). Unfortunately, he never returns. Back in London, Harker’s good friend, Dr. Van Helsing (Peter Cushing), informs Arthur Holmwood (Michael Gough), the brother of Harker’s fiancé, Lucy (Carol Marsh), that Harker has died abroad, and will not be coming back to marry his sister. But the story doesn't end for them there. When Lucy falls seriously ill, suffering from a strange case of anemia, all signs point to the fact that Count Dracula has made his way to in London. Will the Count continue to build his army of the undead in England, or can Van Helsing end Dracula’s reign of terror? As the infamous Count, Lee, like Lugosi before him, seemed born to play the part, successfully conveying Dracula’s sophistication as well as his savagery. Lee’s aptness is evident in the very first scene, when Harker first arrives at Dracula’s castle. During this initial meeting, the Count is ever so polite, and acts more like a butler than the Lord of the Undead. He even carries Harker’s luggage to his room for him. The next time we see Dracula, however, will be under much more intense circumstances. Having been lured out of his room that first night by one of the Count’s wives (Valerie Gaunt), Harker finds himself cornered, and seconds away from receiving a bite on the neck. Suddenly, Dracula bursts into the room. With blood dripping from his teeth and wild, bloodshot eyes, The Count battles his deranged wife, quickly subdues her, then carries her off to another part of the castle. Only two scenes in, and Horror of Dracula has set everything in motion, with Christopher Lee showing us all we need to know about Count Dracula. 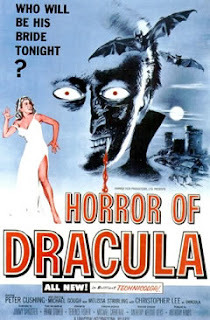 Dracula (1958) was re-released in UK cinemas a couple of years ago with a new remastered print, but I think part of the degeneration of Dracula scene at the end of the film was missing. WaveCrest: Thanks for stopping by, and for the comment. I would have jumped at a chance to see this film on the big screen, remastered or not, though I'm sure it looked good (a shame about that scene, though).